Yesterday, I had an unexpected Wednesday off work due to a computer system upgrade. I spent the morning meeting some friends for coffee and knitting, had lunch with Mike, and then spent the afternoon watching Masterpiece Mystery and making Pizza Loaf. It was a wonderful day. 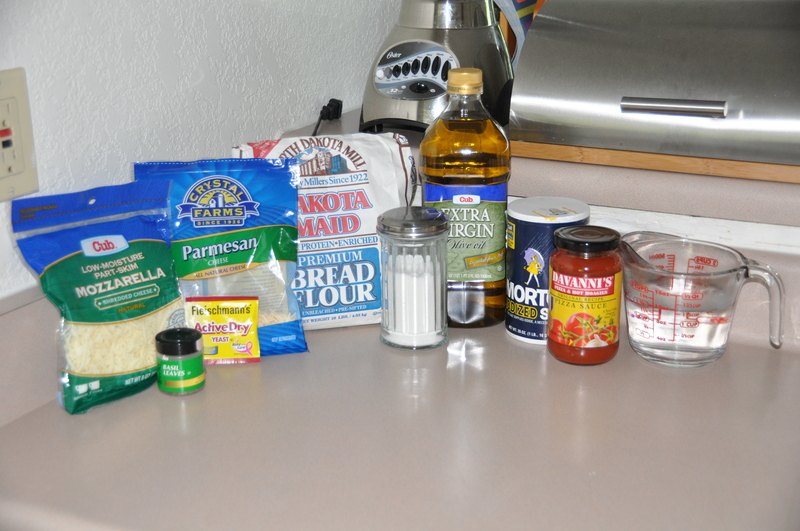 Beard says to use a “prepared pizza sauce that has some flavor and distinction.” I used pizza sauce from Davanni’s, a local restaurant chain, which I’ve found to have the perfect blend of spices. The dough for Pizza Loaf is prepared like a typical bread dough: I mixed the ingredients together, kneaded the dough, and let it rise for an hour. Then, I rolled the dough out into a rectangle (actually, more of an elongated oval) and spread it with pizza sauce and sprinkled on the mozzarella, Parmesan, and basil. Next, I rolled up the dough and joined the ends to form a ring. 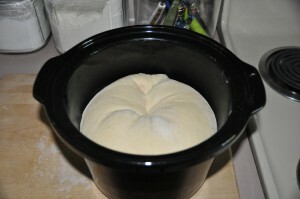 Pizza Loaf is supposed to be baked in a souffle mold. 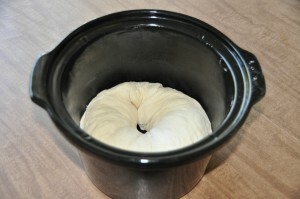 I don’t own a souffle mold, and even if I wanted one I don’t have the storage space. Instead, I improvised and used the ceramic liner from my slow cooker. After letting the loaf rise for another hour–Beard says that “a thorough rising is very important here”–the Pizza Loaf was ready for the oven. I was very pleased with myself that I remembered to move the oven rack down to accommodate the liner’s height before preheating the oven. 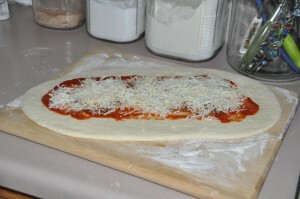 After baking at 400 degrees for 20 minutes and 350 degrees for an additional 35 minutes, the Pizza Loaf was done. Thanks to a thorough greasing of the liner, the loaf came out without any trouble. I cut into the loaf while it was still warm. 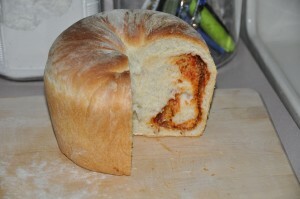 Pizza Loaf isn’t anything fancy: it tastes like homemade white bread spread with pizza sauce and a little melted cheese. 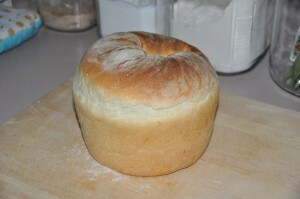 But sometimes, a reliably tasty loaf of white bread with pizza toppings rolled into it is the perfect end to a day. As a postscript, in the recipe notes Beard claims that Pizza Loaf does not keep well. I did not find that to be the case. I refrigerated the leftovers and we had them for lunch today. Mike ate his cold, and thought that it was good; I reheated mine in the microwave and it tasted the same as it did when it first came out of the oven. Occasionally, Beard gets it wrong.